Above: Brian and Carrie Freeman&apos;s Corrales home. After Brian and Carrie Freeman had lived for several years in a frame-and-adobe home Brian built in Corrales, they fell for an alluring lot nearby. In hailing distance of his work at Intel Rio Rancho, it served up killer views of the Sandía Mountains to the east. While they had loved the adobe aesthetic of their original house, both were leaning toward modern design and favoring larger rooms spanned by wide ceilings, which are tough to pull off with adobe. And this pretty new lot wasn’t shackled with the Southweststyle design covenants of their old neighborhood, freeing them up to build as modern as they dared. It was time for change and a challenge—a new house on this new lot—and they were up for it. Brian and Carrie exude an easygoing dynamism that stretches from sport to work: These two get things done and don’t waste time talking about it. They met at New Mexico State University in 1994; Brian grew up in Truth or Consequences, Carrie in Cortez, Colorado. They share a love of the outdoors, and outdoor sports. For their new place, Carrie and Brian knew what they wanted: “very simple, sustainable, low maintenance with clean lines, but also really warm and inviting,” Carrie says. Brian pictured concrete floors, concrete walls, and big windows. “How do you have concrete floors and block walls and have it not be cold?” Carrie wondered. No worries—that’s where Santa Fe–based architect Mike Krupnick comes in. Though much of his work shows a thorough grounding in modernist principles, he knows his way around adobe, too. He started Krupnick Studio with his wife, Kim Ray Krupnick, in 1995, and since then he’s designed projects ranging from chicken coops to adobe-home renovations, spa expansions to high-rise buildings. He recently completed College Town, a 150,000-square-foot residential/commercial development in Tallahassee, Florida, which won an honorable mention in the 2013 AIA Santa Fe awards competition. Above: The kitchen of the Freeman&apos;s home. First they bought the lot. Then Brian, a mechanical engineer with a contractor’s license, drew up plans and sought help refining the drawings, fine-tuning the energy efficiency, and spicing up the aesthetics. Krupnick helped clarify those currents in a north–south, threebox design. He changed rooflines and worked out solar heating in a massive wall in the living room, along with other sustainability refinements. 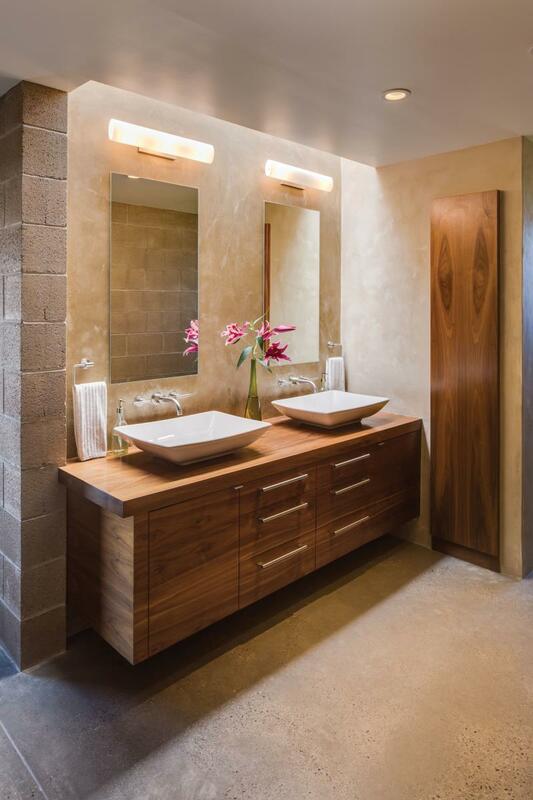 Carrie credits Krupnick with helping her balance Brian’s staunch masculine aesthetic with softer finishes, like the basswood ceiling, walnut cabinetry, and hand-tinted plaster walls. 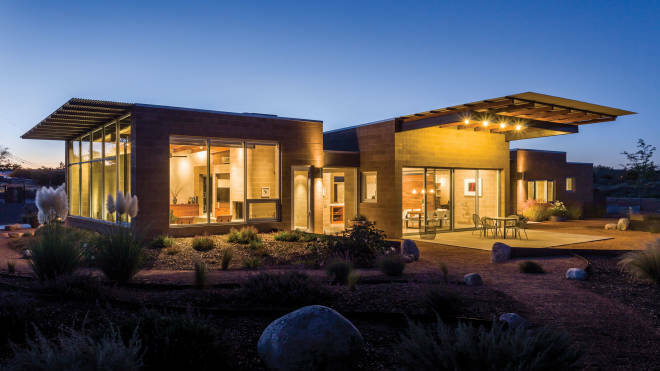 The collaboration worked: In a tribute to its success, the 3,000-square-foot home won a Merit Award in the 2012 AIA Albuquerque design competition, a 2013 Merit Award from the AIA Santa Fe, and a 2013 Citation of Merit from AIA New Mexico. Fitting into the Freemans’ sagebrush-and-sand neighborhood called for a low profile and an eclectic mix of mostly earth-toned—if not earthen—materials. Krupnick wanted to incorporate design elements that acknowledge yet update the rural, opportunistic aesthetic of the village. In Corrales, you’ll see tin-sided equipment sheds, pipe-rail pasture fences, and cinder-block well houses alongside adobe haciendas. It’s a New Mexico thing. So in addition to Brian’s block-wall facade, Krupnick brought in horizontal corrugated metal siding, a flush-to-the-walls shed roof, and a steel-framed, metal-roofed portal that screams “New Mexico” even while incorporating durable industrial materials. That’s regional modernism at its most sincere. Above: The dining room of the Freeman&apos;s home. You enter the 3,000-square-foot home through a discreet west-facing door, partly shielded by a privacy wall pierced by rectangular apertures. Inside, an entry hall separates the living-room wing on the right from the kitchen on the left. A two-sided fireplace punctuates the wall dividing entry hall from living room. To soak up that stunning Sandía view, glass dominates the east wall for the full length of the house, from the living room past the kitchen and dining areas to the office and master bedroom. Two small spare bedrooms occupy a wing just off the kitchen to the west. 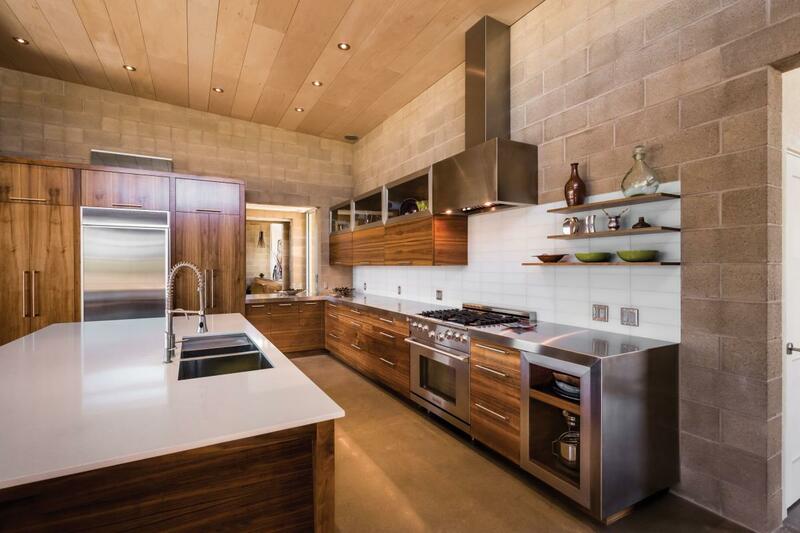 The ultramodern kitchen includes a plain wood dining table, an island with bar stools, and gorgeous cabinetry and glass tile. A sliding barn door made with walnut salvaged from Brian’s father’s scrap pile lets Carrie, who works at home, close off her office and the master-bedroom wing from the dining area. All the furnishings in the house have an element of sustainability—some made by Brian from reclaimed or green materials. 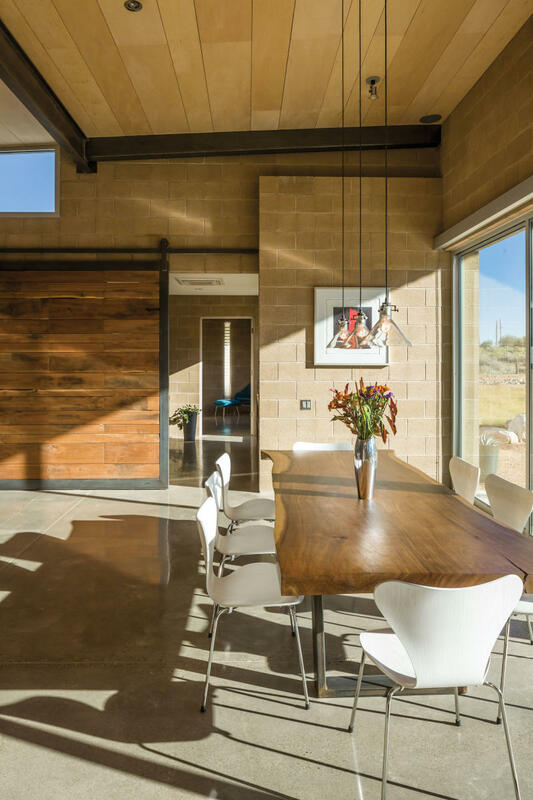 The vast, freestanding steel-frame garage sits off the southwest corner amid casual xeriscaping. Welded-pipe-and-mesh horse fencing surrounds the lot. Given Carrie’s expertise in sustainability, building a supergreen home was “more than the right thing to do,” Brian says. This house gave them the chance to put many of their ideas into action. From the start, they planned to certify the home under the rigorous, independently verified Leadership in Energy & Environmental Design (LEED) program of the U.S. Green Building Council. Though they first aimed for the Gold level—second best—they “saw that Platinum wasn’t that much harder,” Brian says, and went for it. Brian originally wanted cast-concrete walls, but budget calculations steered him to concrete block filled with foam insulation. The two-foot-thick west walls have additional interior framing and insulation. A freestanding block wall in the living room by the full-height south windows soaks up winter sunlight, while high-performance glazing on the east side allows sky-high views without compromising energy efficiency. A five-kilowatt photovoltaic system for household electricity hides on the garage roof. Recycled water from sinks and tubs irrigates landscaping plants and container gardens outside. Above: The bathroom of the Freeman&apos;s home. As cutting-edge green and seriously modern as their house is, it doesn’t break the vibe of the neighborhood. Maybe that’s because form really did follow function in this case. “I don’t spend a lot of time here,” Brian counters. “I’m mostly in the garage,” which is filled with sports toys and tools. The best thing about the house might be how Carrie and Brian made it suit them both through respectful collaboration.